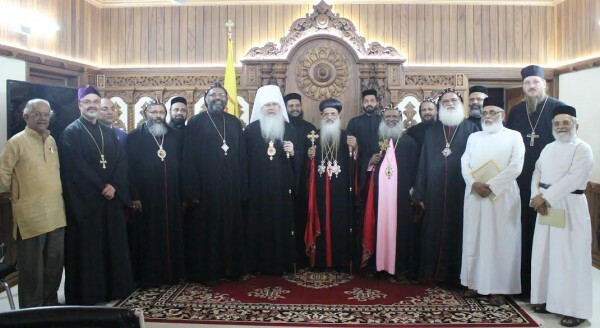 At the invitation of His Holiness, Marthoma Paulose II, Catholicos of the Malankara Orthodox Syrian Church [also known as the Indian Orthodox Church], His Beatitude, Metropolitan Tikhon journeyed to India during Thanksgiving week 2015 to participate in celebrations marking the 200th Anniversary of the Orthodox Theological Seminary here. Accompanying Metropolitan Tikhon were Archpriest Dr. Steven Voytovich, Dean of Saint Tikhon’s Seminary, South Canaan, PA, and Archpriest Dr. John Behr, Dean of Saint Vladimir’s Seminary, Yonkers, NY. 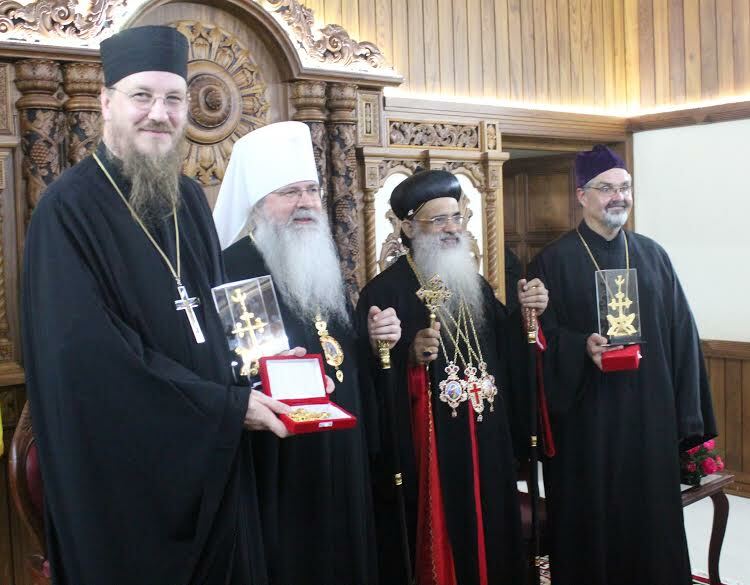 Traveling with them was His Grace, Metropolitan Zachariah Mar Nicholovos of the Northeast American Diocese of the Malankara Orthodox Syrian Church. 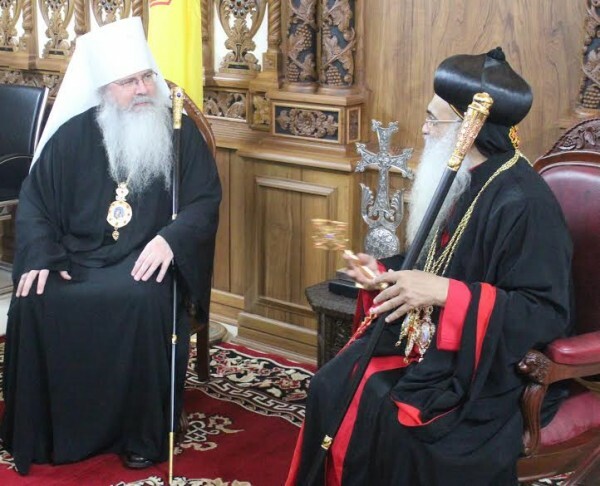 By way of background, Metropolitan Tikhon and Catholicos Paulose had met in Armenia in April 2015 during the 100th Anniversary of the Armenian Genocide. During asubsequent meeting with the Catholicos during his US visit in July 2015, an invitation was extended to Metropolitan Tikhon to attend and speak at the seminary’s anniversary celebration. In recent years, the Orthodox Church in America through its seminaries has developed a strong relationship with the Malankara Church in North America. Many Malankarese bishops, priests, deacons and lay leaders have studied at Saint Tikhon’s and Saint Vladimir’s seminaries. Metropolitan Zachariah is a member of the Saint Vladimir’s Seminary Board of Trustees, while two Malankarese clergy, Priest M. K. Kuriakose and Priest Dr. Varghese M. Daniel, serve on the faculties of Saint Tikhon’s and Saint Vladimir’s seminaries respectively. On Tuesday, November 24, Metropolitan Tikhon and Fathers John and Steven attended the Holy Qurbana [Divine Liturgy] and memorial service for Metropolitan Pulikottil Joseph Dionysius II, the seminary’s founder, and Metropolitan Dr. Paulose Mar Gregorios of Delhi on the 199th and 19th anniversaries of their repose respectively. Catholicos Paulose celebrated the Liturgy in the Old Seminary chapel, in which the late hierarchs are interred, after which Metropolitan Tikhon addressed the gathering. On Tuesday afternoon, Rev. Dr. K. M. George, Director of the Sopana Academy for Studies in Theology and Culture, welcomed Metropolitan Tikhon and Fathers John and Steven at ceremonies marking the school’s inauguration, at which Catholicos Paulose also presided. 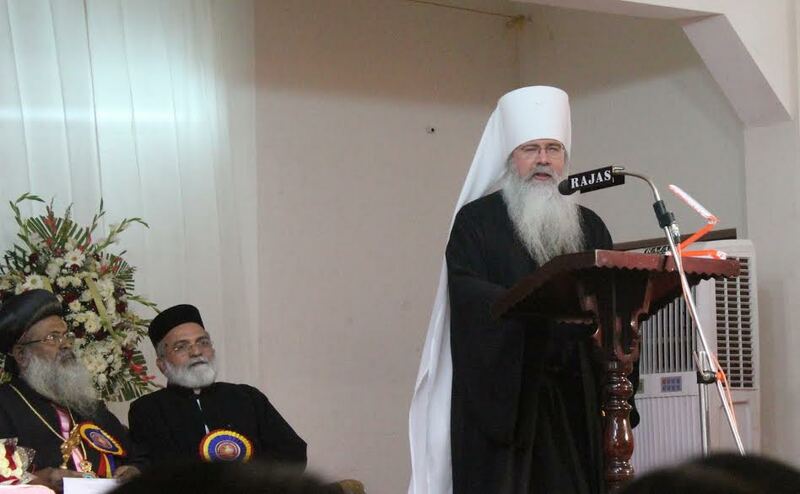 In his address, Metropolitan Tikhon observed that, with its long history and experience in a multicultural and pluralistic society, the Malankara Church is in a unique position to promote study and reflection on how theology and culture have interacted historically and to discern how they might relate today for the common good of society. Metropolitan Tikhon and Fathers John and Steven were received by Catholicos Paulose at the headquarters of the Malankara Church on Wednesday, November 25. After expressing gratitude for the opportunity to experience the life of the Church in India for the first time, especially in conjunction with its major celebrations, Metropolitan Tikhon told the Catholicos that “it is humbling, as representatives of a young missionary Church from America, to be immersed in the life of a Church shaped by 2000 years of history and the witness of the Apostle Thomas, who walked this land and whose relics are here. Our churches are not yet in full communion, but by God’s grace and the prayers of Saint Thomas, may we recognize each other as having the same experience that inspired Saint Thomas to say, ‘My Lord and my God.’” They also were afforded the opportunity to venerate the relics of the Apostle Thomas. After a meeting with members of the Kottayam Seminary faculty, Fathers John and Steven joined Father K. M. George in offering presentations at a symposium for the seminary students. Later the same day, Metropolitan Tikhon was present as the Malankara Church’s new web site was launched. He was “impressed that this ancient Apostolic Church with deeply rooted traditions is equally up-to-date with technology and social media.” In remarking how communication has always been “an essential part of the Church’s mission to witness to faith in Christ—in the first century the letters and Gospels of the New Testament began as an exercise in innovative communication”—he commended Catholicos Paulose for blessing this ministry and congratulated those who labored to bring it to fruition. 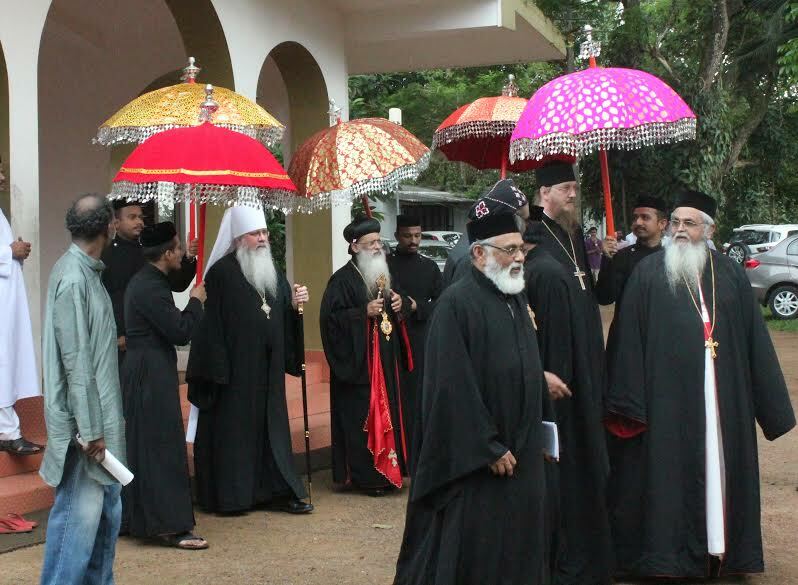 On Thursday, November 26, Metropolitan Tikhon and Fathers John and Steven were among the honored guests attending celebrations marking the 200th Anniversary of the Orthodox Theological Seminary in Kottayam. Catholicos Paulose opened the ceremonies, after which Kerala Governor P. Sathasivam spoke of the important role the seminary has played in the region’s educational life while imparting education in English, Latin, Syriac and Sanskrit. 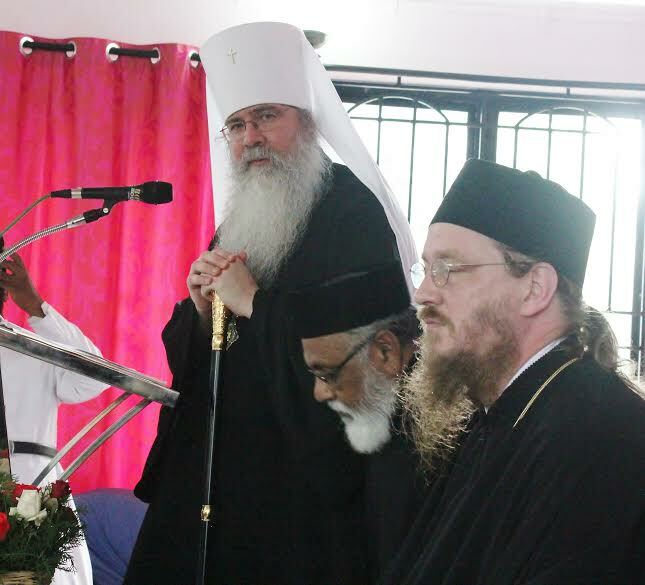 “It is a joy and an honor to be with you today for the culmination of your celebration of the Bicentenary of the Theological Seminary in Kottayam,” said Metropolitan Tikhon in his address. “I am deeply grateful for the invitation your Holiness extended to me and to the Deans of the two seminaries of the Orthodox Church in America to be part of this historic occasion. This helps solidify our growing collaboration in assisting you in training clergy and teachers for your Church in North America. We are working well with Metropolitan Nicholovos, whose headquarters are close by to our own in Long Island, New York. He has been a valuable member of the Saint Vladimir’s Seminary Board of Trustees…. We also offer our deep appreciation for the opportunity that has been afforded our seminaries to contribute in a small way to the education of so may of your students, who themselves have brought to us an abundance of blessings as well. “I should note that in the United States today is a major national holiday—Thanksgiving Day,” Metropolitan Tikhon continued. “This harkens back to the early days of the Pilgrim settlers in Massachusetts, to which they fled from religious persecution in Europe. They had a difficult first winter, with cold and disease, and many died. But with the help of native Americans they survived, and the next autumn after the harvest they gave thanks to God.